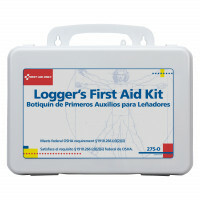 Our 65-piece, Logger First Aid Kit meets the special logging industry requirements in OSHA standard 1910.266A and contains the supplies you're likely to need on the job. The sturdy plastic case includes a gasket to protect your supplies from moisture, keeping them dry and sterile. Gauze pads (at least 4 x 4 inches). Two large gauze pads (at least 8 x 10 inches). One package gauze roller bandage at least 2 inches wide. Wound cleaning agent such as sealed moistened towelettes. Resuscitation equipment such as resuscitation bag, airway, or pocket mask. Directions for requesting emergency assistance.